“Ever notice how you come across somebody once in a while that you shouldn’t have messed with? That’s me.” That’s scowling, growling Walt Kowalski. He’s a retired Detroit autoworker. He’s a Korean war veteran. And he’s Clint Eastwood’s first big-screen role since Million Dollar Baby . But really? He’s The Man With No Name. He’s Dirty Harry. He’s William Munny. He is Clint Eastwood. Named after the 1972 car that Walt built himself on the now-defunct Ford factory line – it sits on his driveway like a gleaming symbol of the past – Gran Torino is a fully fuelled vehicle for its star and director to deliver a salute to every badass he’s ever played. Big, veiny, muscular arms. Skin you could make a satchel out of. Teak-tough hands that could crush your head like a grape. Clint Eastwood is 78. They don’t make men like they used to. And, like so many of the characters he’s played in six decades on screen, Walt is a man from a long-gone era. Sitting on his porch with a beer and a dog, guarding his home like an Old West frontiersman, Walt is annoyed by everything. His doughy middle-aged sons driving around in Japanese cars. Their prattling wives trying to put him in a retirement home. His pierced teenage granddaughter texting her way through his wife’s funeral. The wet-behind-the-ears priest (Christopher Carley) who keeps showing up on his doorstep asking for a confession. The racial gangbangers who cruise the streets looking for trouble. Believe it or not, as Walt becomes a reluctant neighbourhood hero by saving his neighbours from local gangbangers, Gran Torino isn’t the comedy-racism film of the year. Well, maybe it is that too. But mostly, it’s a generic, enjoyable drama about Walt’s grudging, growing friendship with quiet, fatherless Hmong boy Thao (Bee Vang) and his sassy teenage sister Sue (Ahney Her). As storylines go, this older and craggier than even Clint. The Asian children thaw out the racist old man’s heart. The racist old man discovers he really likes Asian food. Taking an over-obvious tilt at racial prejudice, debut screenwriter Nick Schenk’s script etches broad characters, brims with heavy-handed drama and spells out what it doesn’t need too. At one point, Walt stares into the mirror and ponders, “I’ve got more in common with these gooks than I do with my own family.” Despite his Korean war psyche-scars, he’s a caricature searching for depth that isn’t there. So why does Gran Torino never slide into self-parody? Because at other times, it’s something beautifully subtle, exploring the themes of vengeance, violence, hollow heroism and past that have fascinated Clint for decades. Because Eastwood himself is irresistible and immense in every frame. Because even the self-serious final showdown in which Walt kills his demons and finds salvation feels like a symbolic farewell to the American icon’s urban-avenger persona. Sure, it’s no legacy-capper like Unforgiven , which won him the first of two directing Oscars. But Eastwood makes it greater than the sum of its parts – there’s something here that matters way more than his glossy Oscar-baiter Changeling. Ambling patiently along, Gran Torino isn’t one of his best films. Not even close. But it might be one of his most personal, most enjoyable and most important. Clint’s own raspy warblings of the self-penned end-credits song could be the last we ever hear of him in front of the camera. So you can get as much or as little as you want from Gran Torino. It’s a movie for Eastwood fans. Which should mean it’s a movie for you. 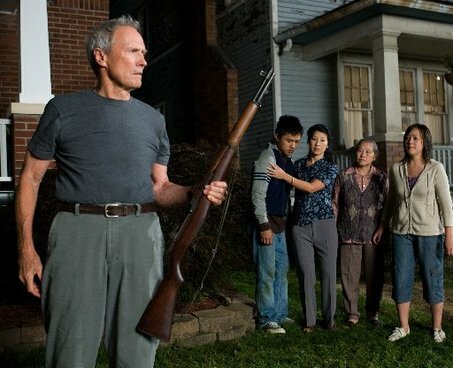 Tough, sensitive, funny, craggy, old fashioned… For better or worse, Gran Torino won’t make your day. Clint Eastwood will. Do you want to risk missing his swansong performance? Well do you, punk? Clint’s iconic law-breaking cop hands out gunishment to society’s scum. Odd-couple OAPs Walter Matthau and Jack Lemmon give each other grief while waiting for death.